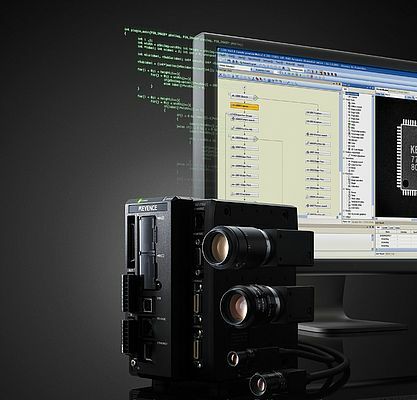 The latest Keyence machine vision system, XG-7000 series, can also be programmed in a PC environment. Its controller houses a powerful image processing platform dedicated to avoiding problems of overloading and maintainability commonly found with conventional PC system. The flowchart formed XG Vision Editor software is intuitive, fast, and flexible, and can be fully personalized. The users simply drag and drop processing 'blocks' to create the flow. A wide range of algorithms and filters are available. Among them are the ShapeTrax2 positioning tools, the stain defect detection tools, and the edge measurement tools. As an extra feature, the system provides the possibility of executing operations on the images before processing them; this enables use of image calibration and distortion correction systems that are in strong demand in the field of robotics and dimensional measurement. Bar codes, OCR and 2D codes can also be read. The system's flexibility also lies in the possibility of integrating the source code written in C. It is then possible to execute algorithms and specific filters, and import existing applications. New debugging, simulation and trace log tools can be used to test the vision program and the interface in order to reduce integration time. The series offers security by managing user rights and keeping a log of changes. It can handle up to 100 users with 5 access levels. The controllers can be networked and accessed remotely using software to view and test the changes made from a remote terminal or via the Internet, without stopping production. An FTP server can be used to send the information (data and images) to a central monitoring system. An integrated ActiveX component enables control of the vision system. The ActiveX control can also be used to create measurement data, obtain information concerning results or historical data, and manage files. The system provides the possibility of processing 1 million pixels in 20.5ms. This calculating power also enables implementation of multiple controls and further enhancement of production control. It has 7 times higher repeatability than the current standards. Numerous image processing features are available to optimize the precision of the controls. The models in the series are controlled by a high-speed colour image processing engine and a fast RISC processor linked to two DSPs that are specific to the image processing system. Overall, they use four processors to provide parallel processing and the highest possible processing speeds.